Controversial marketing, how it works...sometimes. Controversial marketing has a proven track record of working. We’re not talking grossly controversial. That would just sink your brand completely. We’re talking controversial enough to get people talking, pique an interest and even have one or two people say “Hey, was that too far?”. I can guarantee the majority of people reading this opening paragraph were automatically thinking of Paddy Power. The first sign controversial marketing is working? the mere mention of controversial marketing evokes thoughts of your brand. Well done Paddy Power! The leader in controversial marketing. Paddy Power, the leader in controversial marketing. The fact is, Paddy Power are king of controversial marketing (in Ireland anyway). So we’re going to discuss them a little before moving on. It’s obvious that this controversial approach to marketing is working for them. if you look at Paddy Power’s Twitter and Facebook accounts, they boast some of the highest likes and followers from the betting market. Even a quick glance through their feed will give you a great idea of the type of controversial content they push out. It’s this quirky and often controversial content that pushes Paddy Power to the front of the consumers mind. One of Paddy Powers controversial campaigns. You look at other brands who have followed in a similar fashion; Hunky Dory’s, McCoys and Club Orange. Yes, their content may have been complained about over and over, but anyone who is interested in or has studied advertising has read at least one case study on these brands. On top of that anyone without an interest in advertising has either laughed at or complained about these ads. So whether it’s positive or negative feedback, people are still discussing you’re brand and that’s a good thing…in most cases. Is there such a thing as bad controversy for a brand? Jump across to England for a minute. 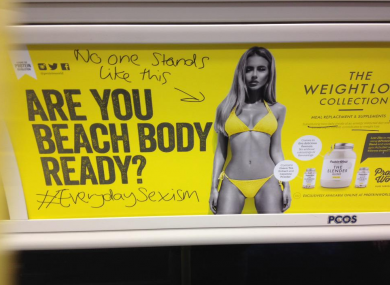 A little known company called Protein World put together a campaign titled “Are you beach body ready?”. Totally unsuspecting of the backlash that was to hit them. The problem with this ad is that it completely went against extremely popular and positive campaigns which have had a massive impact on people (read as Dove’s ‘real beauty’ campaign). It led to all sorts of ‘counter’ campaigns which actually, in the end became more popular then the Protein World campaign. Bad controversial marketing by Protein World. That being said UK Marketing Magazine believed that the controversial marketing campaign made a “little known brand into a household name”. Generating an estimated €1.4 million in direct sales revenue. So could you still class this as a bad controversial marketing campaign? from a sales point of view? definitely not. What we want to know is how do brands become loved and adored for their controversy and why do some become loathed? Intentionally controversial Vs. Unintentionally controversial. As bizarre as it sounds we believe it comes down to being intentionally controversial. The Paddy Power campaigns were created so that people would talk about them and create a buzz around the topic. Whereas the Protein World campaign was just badly thought out and the company were unaware that so many brands were fighting against the topic or image you’re portraying. Dove respond to the controversial marketing campaign. It’s worth noting that if your going to try controversial marketing make sure it resonates throughout the entire company not just it’s marketing. Speaking at Marketing’s Digital Exchange, Richard Harris, Head of Online Marketing at Paddy Power said that this controversial trait the brand holds, “extends across every layer of the organisation”. In a recent set of annual reports, the finances took on the theme of the horse meat scandal, with each section paired with a specific cut of the horse. Oh and the reports also played the black beauty theme.